While most of the team rested from competition, Notre Dame sent athletes to Geneva, Ohio, this weekend for the SPIRE Invitational. Graduate student Nick Happe also went to Seattle for the Husky Classic in an attempt to qualify for the NCAA Championships. 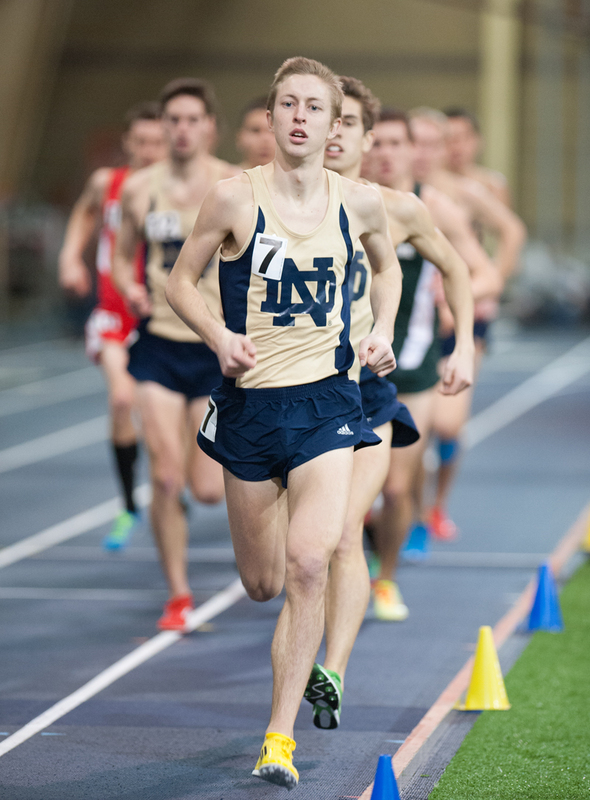 Graduate student Nick Happe runs in the Notre Dame Invitational on January 25, 2014 at Loftus Sports Center. Happe finished fourth in the 3,000-meter run at the Husky Classic on Saturday in Seattle, Wa. One week removed from hosting the Meyo Invitational and with just less than two weeks before the ACC Indoor Championships in Clemson, S.C., Irish coach Joe Piane elected to rest many of his athletes, including graduate student Jeremy Rae. Rae’s time of 3:57.25 in the Meyo Mile last week set school and personal records and set him solidly atop the ACC in his signature event. However, Happe, whose solid time of 3:59.58 claimed third in the event, went to Washington in the hopes of qualifying nationally in the 3,000-meter run. Happe’s fourth-place finish in the race with a time of 7:54.39 accomplished just that. Piane said his main goal for the weekend was to qualify Happe for NCAAs and that he was very happy to see that happen. While Happe went west, the Irish sent most of their athletes — 20 on the women’s side and 16 on the men’s — to Ohio for a second-to-last tune-up before conference championships. Among the female athletes who traveled were senior Kelly Curran, whose event record time of 4:37.10 in the women’s Meyo Mile also ranks first in the ACC, sophomore Margaret Bamgbose and senior Michelle Brown. Brown won the 400-meter dash and set a Meyo Invitational record with a time of 53.15 seconds. Among the men were senior All-American Patrick Feeney and fellow sprinter and junior Chris Giesting, who also took home first in the 400-meter dash last weekend with a time of 46.38 seconds. Individually, the Irish got strong performances from a number of athletes. Feeney and Giesting finished second and third, respectively, in the 400-meter with times of 46.39 and 46.44 seconds, just behind Pittsburgh senior Brycen Spratling. Bamgbose also took home a second-place finish in the women’s 400-meter with a time of 54.24 seconds. However, the Irish fell just short of qualifying the women’s distance medley relay Piane had targeted. However, Piane also said his focus was starting to shift toward readying his teams for ACC and NCAA championship competition. The Irish are back at home Saturday to host the Alex Wilson Invitational at the Loftus Sports Center as a final test before the ACC Indoor Championships begin Feb. 27. Sophomore from Ann Arbor, MI in Sorin Hall intending to major in Finance. Avid fan of the NBA and my Tigers, Pistons, and Lions.